Sima has a Masters Degree in Architecture, and she spent many years as a practicing architect, designing and building numerous projects. For the past 21 years she has been a proud resident of the Brentwood/Santa Monica area of Los Angeles, California. In that time, she has owned several income properties in Santa Monica and she is intimately familiar with rent control and its issues and nuances. Sima’s real estate experience includes more than just the buying and selling of private homes. She has been involved with properties as a landlord, tenant and agent. She has an enormous vault of information about rental properties, 1031 exchange, reverse exchange, private annuity trust and all other aspects of the real estate. Sima is a board member of SIAP “Society of Iranian Architects & Planners”, a member of NAR “National Association of Realtors”, a member of UN “United Networkers” and a hard working and Knowledgeable agent. A mother of two Berkeley graduates, Sima is very proud of her family. Her husband is a CPA a partner of the biggest Iranian CPA firm. 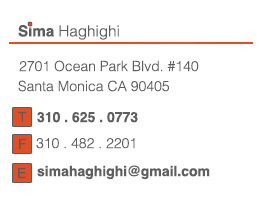 Call Sima for all of your Santa Monica real estate needs.